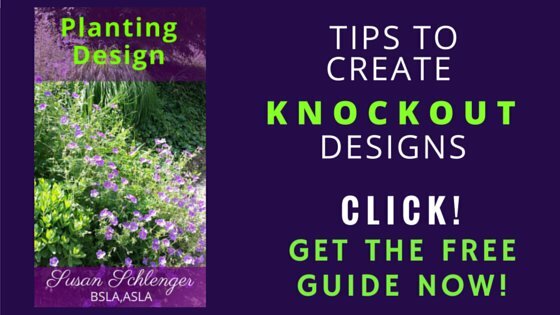 Learn how I create planting designs for my clients. Discover great, useful tips and ideas. Click here to get the Planting Design Guide - FREE! 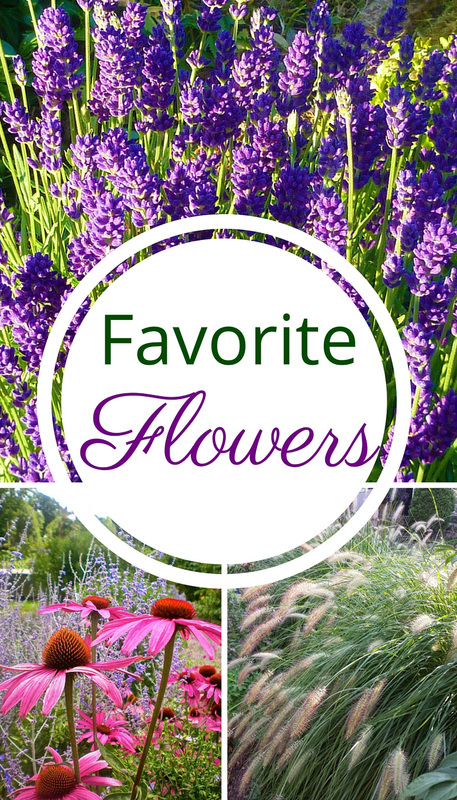 On this page you will find some easy to grow flowers if you just don't have the time to fuss or are a beginner with perennial flowers. 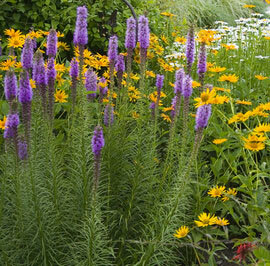 There are, however, a couple of minor things you should do to keep these low maintenance perennials looking their best. 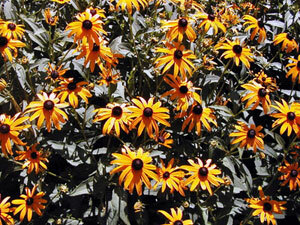 Cut perennial flowers back to about two to three inches high in the fall or spring. I do mine in the spring since I can't stand to look at bare spots all winter long. I would rather have remnants of the perennial plants, unless they are extremely untidy looking. Water as needed. Many easy to grow flowers are drought resistant, so I would choose these to keep from worrying if the perennials are lacking moisture. Remove flowers that have finished. This is not a necessity ...you can leave the plants completely alone. However, by removing the spent flowers, you keep the plant looking neat and also (for most plants) cause them to produce more flowers. 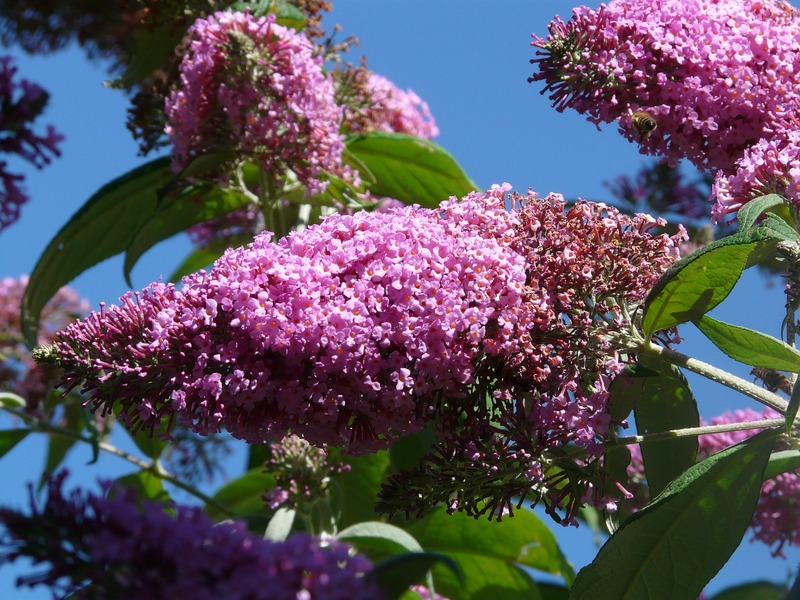 For example, by pinching back the flowers that are done on the Butterfly Bush, the plant will continue to bloom for a much longer time period. 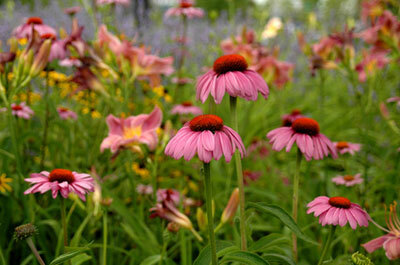 The following perennials are for sunny conditions. Also visit my page on shade perennials. This is a great perennial for flowers later in the season. It blooms late summer and into fall. It is extremely drought resistant...actually it doesn't even LIKE a lot of water. 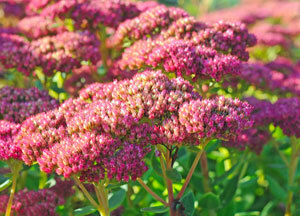 Sedum in the forefront before flowers turn to pink color. In flower, usually in September/October. 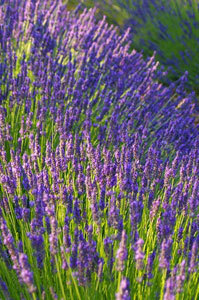 Lavender is not only a low maintenance perennial plant, but also is drought resistant and has a great fragrance. Cut off lots of the lavender stems, tie them together with a pretty ribbon and you have a wonderful, fragrant bunch of flowers. Dry them and they will last quite a long time. I've grown this perennial for years and it rewards me with becoming larger and more beautiful as time goes on. 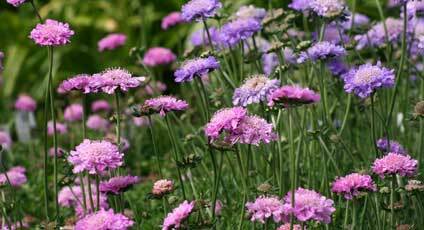 It's one of the long blooming perennials and had to include it in this list of easy to grow flowers. Ok, not perennials. 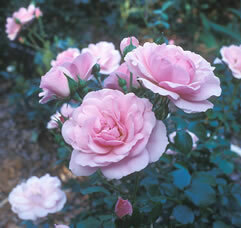 Although they are shrubs, these roses are EASY to grow. You shouldn't get any blackspot or fungus. If you get some aphids, just hose them off! 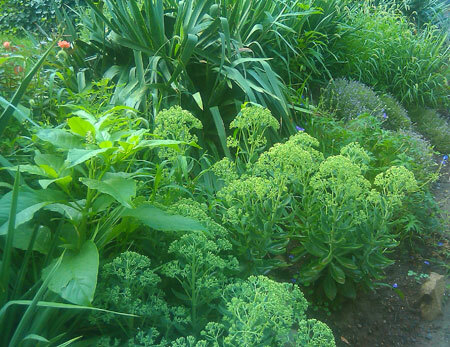 This perennial resembles a shrub in that it gets much larger than many other perennial plants. It doesn't require a lot of water, has a long period of bloom, and attracts...yep...butterflies. 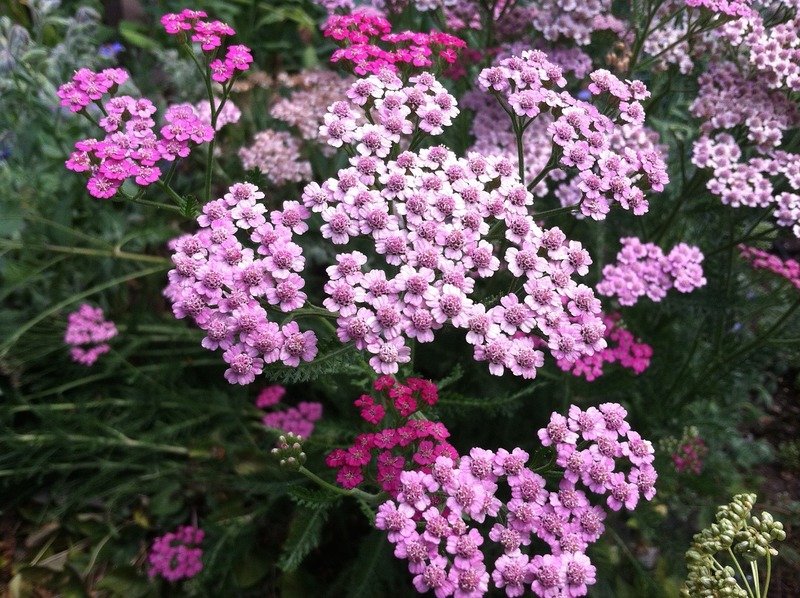 Yarrow comes in many colors, except maybe purples or blues. It's very easy to care for. I grow this myself and it is so low maintenance! This is one of my favorites. It just keeps blooming, particularly if you cut it back about halfway during mid-summer. 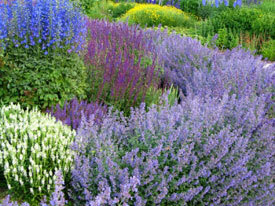 It has soft lavender colored perennial flowers with gray-green foliage. Leave enough room for it as it can get to be about 30 inches wide. In my opinion, this is a must have in gardens. It's drought tolerant and very low maintenance. More Catmint here. This spiky mid-summer blooming perennial has showy bright pink flowers and is a nice vertical element in the garden. Its' foliage looks like an ornamental grass. 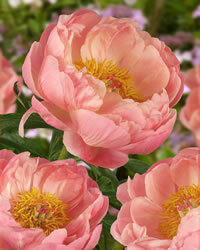 Peonies are old-fashioned perennials that live for many, many years. When in bloom, their large flowers are a beautiful site. They come in various shades of peaches, pinks, from pale to bright, and also come in white. Peonies look like small shrubs and maintain their foliage throughout the season. The purple perennial flowers of this plant bloom for about three weeks. They are easy to care for, requiring little water during dry spells. They are quite striking while in bloom! The rest of the time their soft foliage is an interesting color and texture. This design is from one of my projects which won a planting design award. With its common fall color of gold, this perennial is often seen blooming at the end of summer and during the fall. Remove spent flowers to extend the bloom. Whether it is the variety that you see here, one with rust centers, or paler gold plants, Black Eyed Susans look well with many other late summer blooming perennials. These easy to grow flowers come in various heights also. Be sure to water them in the hot weather. 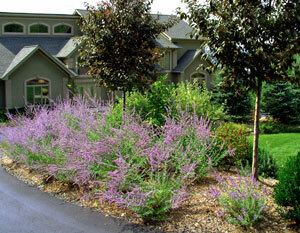 Looking for a landscape design for your property? Click here if you live in New Jersey. Click here if you live anywhere else in the U.S. or Canada. Need some coaching? Find out how I can help you!